Last weekend I had my beautiful niece over for a sleepover party! It was super fun – we had a game night and did lots of drawing and artwork! All three of my girls do crafts and artwork any chance they can get, especially my 11-year-old daughter. She’s completely obsessed with tons of arts and crafts. Her favorite right now is clay and big girl coloring books aka grownup coloring books. The pages take her a couple of hours for each page. She shuts herself in her room, turns on some music and colors every chance she can get. Anyway, back to the sleepover and breakfast. . . . In the morning we had breakfast – and when it came time to decide what everyone wanted to eat, it was unanimous. We all wanted pancakes. This Paleo pancake recipe makes it possible for everyone to have the same meal in the morning. Not to mention the fact it is packed full of bananas! This is very light and fluffy Paleo pancakes; you could never tell they are super-healthy compared to “normal” pancakes. As a side note for this specific recipe: These pancakes need to be cooked at a somewhat lower temperature than regular pancakes to help them set a little better before flipping. Take care to not let the heat rise above medium. It may be a little more work to get out and measure three types of Paleo flours, but you really do get the best of all three types of flours and minimize the negative aspects of each type of flour. It makes it so you can’t taste any one type of flour. These pancakes are so filling, compared to normal pancakes. I am always so full after eating them and often eat them for dinner with some Paleo bacon and some fruit, like the blueberries shown in this image. I also love that they are a good way to get healthy carbs on the Paleo diet. I used to be so afraid of carbs before I went on the Paleo diet. Then I discovered that good carbs are – well, good for me. And there’s something about the satisfaction you get from eating healthy carbs that really helps give you energy throughout the day. I love to have fluffy paleo pancakes for breakfast, lunch, or dinner! 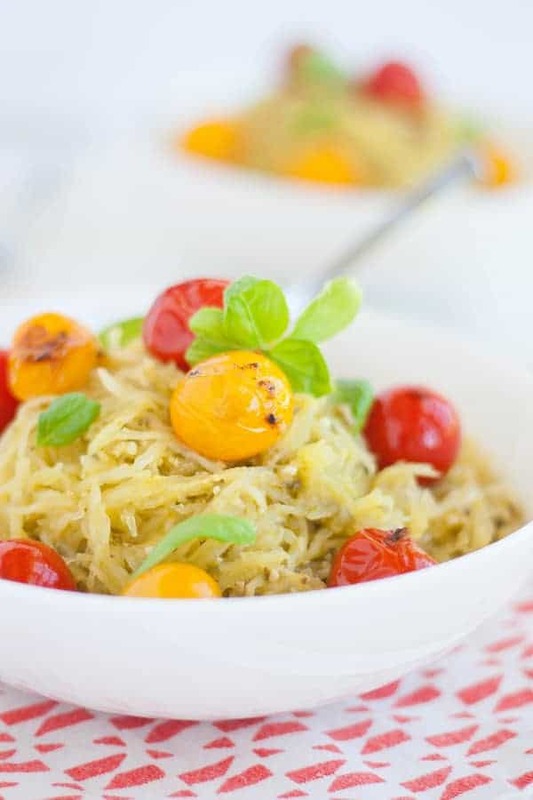 They are so versatile, you can have so many different toppings with them depending what you are feeling at the moment. What are your favorite toppings for your pancakes? Are you a waffle or pancake person? Almond flour is the most widely used Paleo flour in my opinion. So, yes almond flour is Paleo friendly. How many carbs are in 1/4 cup of coconut flour? 1/4 cups of coconut flour have approximately 120 calories, 4 grams of protein, 4 grams of fat, 10 grams fiber and 16 grams carbs. Can I use coconut flour instead of all purpose flour? Not straight across and it takes a lot of experimenting to get it right. I suggest you just find a recipe that someone else has been the guinea pig for lots of times and use that recipe. Coconut flour is extremely absorbent so compared to any other flours you use very little. Coconut flour contains fewer carbs than other nut flours. It has more calorie-free fiber than wheat flour and is a good source of protein. Can I use almond flour instead of all purpose flour? No,, it can’t be substituted straight across. Most gluten-free flour requires more moisture and sometimes thickeners. They are usually denser. So you really need a tried and true recipe that’s been proven to be good. These paleo pancakes are nice and fluffy, they taste great with any toppings you would like. In a mixing bowl, whisk together the tapioca flour, almond flour, coconut flour, baking soda, and salt. Add the mashed banana, oil, eggs, and vinegar and stir with a whisk until smooth. Add the coconut milk and whisk in until batter is smooth. Heat a greased skillet on medium – medium/high heat. When skillet is hot, pour the batter into rounds in the pan. You should have enough batter to make 8 pancakes. Let the pancakes cook until the batter starts bubbling up on top and edges are set. Flip and cook for another 30 seconds. Repeat with remaining batter. I love how easy it is to make pancakes and my children love my pancakes and enjoy trying different types of pancakes. 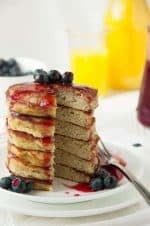 All of the pancakes on this page are Paleo, which means they are all grain-free and dairy free; plus I tried to find ones that are easy to make. I hope that we provided some recipes that might interest you. I put a variety of different basic recipes and many different flavor ideas that will take a plain pancake to the next level. You have got to check out these Paleo Breakfast Pancakes. I bet you’ll be surprised to find all of the different variations of what you thought were boring Paleo pancakes. 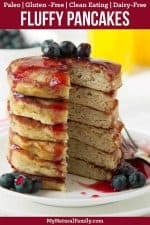 Most of these Paleo Breakfast Pancakes are sweetened with honey or maple syrup and many use coconut oil or ghee and coconut milk. 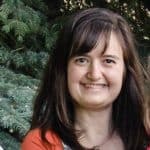 There are some creative recipes here; I think you will really enjoy them and I hope you will try them out. Don’t let Paleo Breakfast Pancakes be boring or bland ever again! So here you go – Paleo Breakfast Pancakes! This is a basic pancake recipe made with almond flour. They have a little bit of a nutty flavor. Of course, they aren’t as soft as the pancakes you’re used to. As long as you realize that, we’re good. Tapioca flour is added to help bind the ingredients together and helps make them fluffier and lighter. It also helps make them easier to flip without falling apart. They will taste fine without it, but I recommend it. I love the flavor of tapioca flour. There are a lot of Paleo pancake recipes out there that are made with bananas as the main ingredient. To that, I say. No Thank You. I like these because they don’t taste like scrambled eggs or bananas. I want my bananas to taste like bananas and my pancakes to taste like pancakes. Anytime a recipe is made with only three ingredients you know it has to be pretty simple to make. Think about it, there are only three things to measure. These main ingredient in these are bananas. I know that some of you like that. Remember those peanut butter banana sandwiches you had as a kid? Well, these taste a lot like those. Those were the good old days. 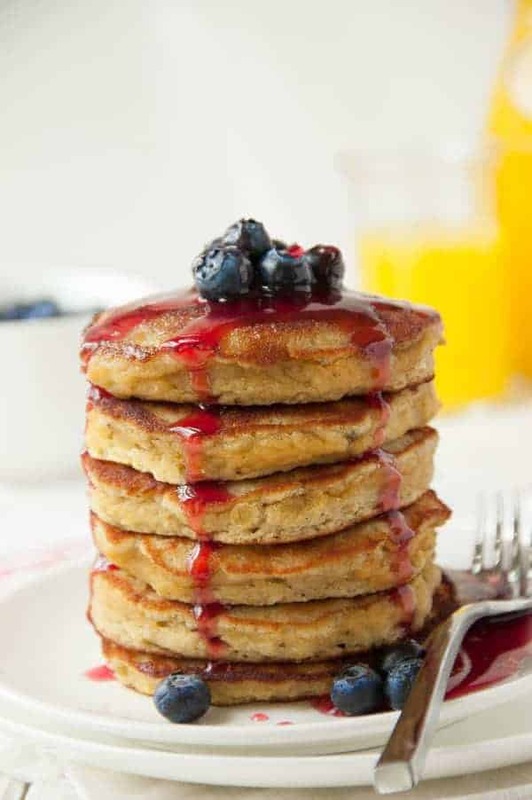 These “buttermilk” pancakes are grain free with nut butter and chocolate sauces. They are called buttermilk because if you didn’t know, you can make buttermilk out of regular milk by adding vinegar to it, which in turn makes it sour. Then you have “homemade” buttermilk. You can do the same thing with almond milk. You should give it a try. It’s really easy. These are light and fluffy and bursting with blueberry flavor. As a precautionary word, don’t be tempted to mix them too long. If you do, you’ll lose the amazing fluff factor. The blueberry compote is simple and made with maple syrup. I think you’ll really like them. Cassava flour is a new favorite flour among the Paleo community I guess you could say. It has many wonderful qualities and is really a flour you should look into if you haven’t already. If you’d like to learn more about it and find other recipes made with cassava flour you can go to my Paleo Cassava Flour Recipes Index, Pros, Cons and Best Prices post. 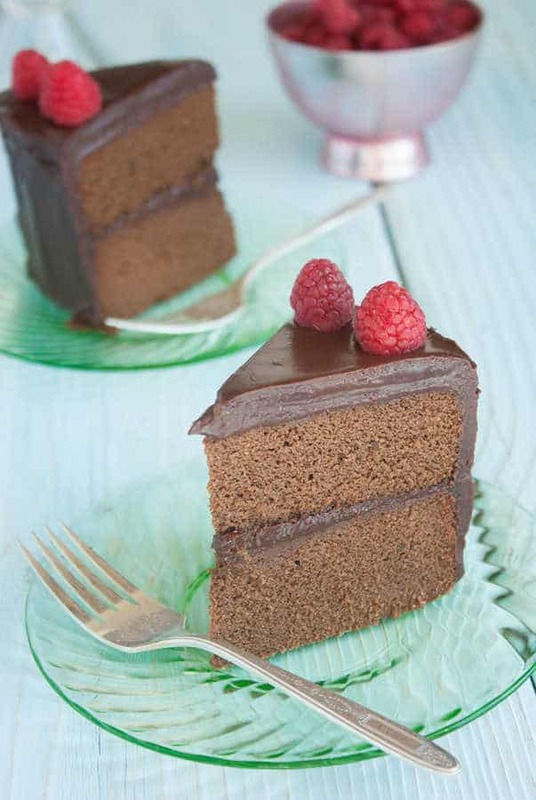 My mouth is watering just thinking about eating raspberries and chocolate chips together for the recipe. I love butternut squash and I definitely love it in recipes like these pancakes. It not only adds so much flavor but it makes them so moist and then it makes them really healthy. To me, that’s a win win win situation. This would be a perfect way to use up leftover butternut squash from dinner the night before. Then they’d be much faster and easier to make. These muffins are just like sausage and pancakes, that is except for the shape and the way you cook them. Well, they are actually muffins but they taste like pancakes. I love the flavor of sausage with pure maple syrup. They simple to make. You just bake them in the oven instead of standing over a frying pan and flipping. While they are baking you can do something else, like take a shower. That’s why I think they are actually easier and don’t really take much if any longer. Your time is just spent doing something besides slaving over a hot grill. All that sugar in store bought cereal would make a monster out of anyone. The other day I was in the grocery store and saw someone with a cart chocked full of those cheap sugary cereals in the huge bags. I couldn’t believe it. Oh my GOODNESS. I love these!! Trying to not eat the whole batch. Just starting off being paleo and found your site. I topped mine with flax seed oil (grew up having it on pancakes & toast-my dad works at a plant that processes them) and then blended some strawberries with a little bit of real maple syrup. So so good. Going back now for seconds! 🙂 Thanks for posting this recipe! Thank you for developing such a good Paleo pancake recipe. Can the pancakes be frozen? We aren’t big into freezing things and so I haven’t tried it. It is worth a try if you think it would. Let us know how it works out if you try it. Yay! glad you guys liked them! What is the serving size? You give quantity of servings, 8, but not serving size. Are we talking about 1, 2, 5? Also what is the typical size of the pancakes when you’re making them. Small would be about 3 inches in diameter, medium probably around 4.5 inches, and large 6 to 7 inches. Well I would say it depends on how thick you like your pancakes. We usually would do about medium size and thin. It is more about preference and how you like them so it would make less than 8 if you like them thick and big. Thank you so much for sharing this recipe! I went paleo recently and was craving pancakes. I made these and they were delicious. My family didn’t even realize they were paleo. 🙂 So yummy! I am trying really hard to get my kids off commercial cereals. I didn’t realize what monsters I created by allowing that junk in my house.